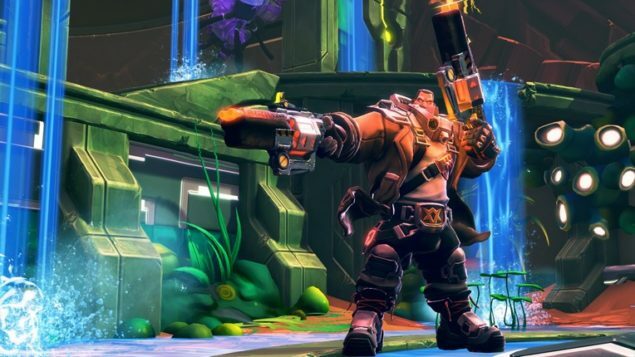 Battleborn welcomes two new playable heroes to its cast, jennerit spymaster Deande and shotgun-carrying Ghalt. The two new heroes have been announced as part of IGN’s IGN First feature. Battleborn from Borderlands creator Gearbox Software, features a total of 25 unique characters. These heroes form an unlikely alliance to save the last star in the universe from a mysterious enemy hell-bent on its destruction. The Jennerit Empire is 20,000 years old, and Deande has served as its Spymaster for over 1000 years. That’s a long time. See, the Jennerit have discovered a process called Sustainment, essentially becoming immortal. Not everyone of their kind can do it; it’s a very expensive process. But a number of the leadership and key figures are all Sustained. They can be killed, but they won’t die of natural causes. In gameplay, Deande is the stealth / deception character. She’s an attacker and assassin archetype wielding iron-tipped fans that she uses to slice and fling at her enemies. In keeping with her deception themes, Deande can create a clone of herself that actually uses specially programmed AI. It doesn’t just run straight or sit in place and look funny. According to Gearbox, Deande’s clone attacks and defends and moves in ways similar to how a player would on the battlefield. At the same time her decoy goes out, she enters stealth, where’s she’s able to move around undetected. Once invisible, she can perform a short-range dash that ends in a big burst-damage attack. Enemies hit are weakened, and knocked back, and in that kind of the classic rogue backstab archetype, the ability can be modified through Deande’s skill helix to get increased bonus damage if done from behind. And for her finale, Deande’s ultimate allows her to bounce around doing 10 strikes by default, and stunning enemies for a very short period of time. Every enemy caught in her targeting cone when the attack triggers gets hit, but if there’s only one enemy, they’re going to soak up all the strikes, making her damage incredibly deliverable in burst. Out of all 25 Battleborn, Trevor Ghalt was the first. As the stars began to darken and get torn away from the universe by an unknown enemy, Ghalt, as a Peackeeper, a military veteran, and someone’s who’s been around the block, has seen a bunch of those wars and conflicts firsthand. Everybody likes Ghalt and knows him to be a man of honor and respect. He’s a good guy and a good leader. In gameplay, Ghalt is a shotgun-toting powerhouse designed to manipulate the flow of enemies on the battlefield as the hook and trap specialist. By default, Ghalt’s deployabletraps damage and stun enemies caught in them for two seconds. But like most characters in Battleborn, you can augment and modify this ability through Ghalt’s skill helix, modifying the traps to do more damage, or become invisible, or even pop up small turrets that shoot enemies. To compliment his trap, Ghalt’s other ability is a hook he can fire out, and if it lands on an enemy it pulls them in close. A good Ghalt is always looking to set up a trap and hook combo: lay down a trap, yank them into the trap with the hook, and then unload his customizable shotguns into them for lethal burst damage while they’re stunned. For more resilient opponents, Ghalt’s ultimate allows him to whip out a second, identical shotgun, doubling his damage with dual fire for a limited time. Battleborn’s narrative-driven story mode can be played alone or co-operatively by up to five friends splitscreen and online. The game’s three different competitive multiplayer modes can be played by up to 10 players online in action-packed 5v5 matches. Regardless of the mode being played, players will experience deep and customizable character growth for all 25 playable heroes. During Gamescom 2015, Gearbox announced four new playable characters, including Ambra, Melka and Reyna. 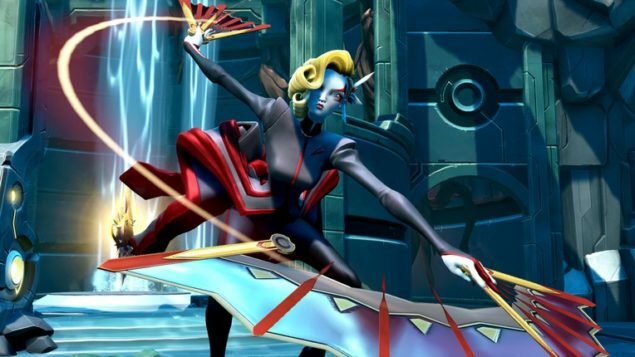 Battleborn is slated for a release on May 3 for PS4, Xbox One, and PC.